Ahi Tuna Tartare - A recipe from Savor California, the online showcase for extraordinary gourmet foods and beverages from California. Recipe courtesy of Chef Clint Davies. Using a sharp knife, carefully cut the tuna into uniform 1/4-inch dice and refrigerate in a stainless steel bowl. Uniformly mince the pickled ginger and shallot and place in a small bowl. Add the soy sauce, mirin and a little of the pickling juice and allow to macerate for 1 hour. Slice the taro root 1/8-inch thick on a mandoline and store in cold water. Punch out each piece of taro root in circles approximately 2 1/2 inches in diameter (the taro chips don’t have to be cut into circles if you don’t have a cookie cutter this size). Heat either a deep fryer or a cast iron pan of canola oil to 300 degrees and fry the chips until they stop bubbling and become crispy. Transfer to dry paper towels and season with salt immediately after removing from the oil. Zest the yuzu into a bowl. Add the Dijon mustard and the juice from half the yuzu. Using a whisk, mix together well before slowly drizzling in the grapeseed oil to form a dressing. Adjust seasoning with salt and pepper. Remove the diced tuna from the refrigerator. Peel the Asian pear and dice the same size as the tuna, then add to the bowl along with the diced pepper, ginger and shallot mixture and the dressing. Gently mix until well combined. Taste for seasoning and adjust with salt and pepper if necessary. 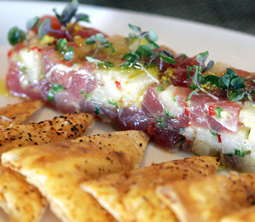 Make individual hors d’oeuvres by mounding the tuna mixture on taro crackers. Or mold by pressing tuna mixture firmly into a baguette pan and unmolding onto a serving platter. Serves 4 as an appetizer. Or makes 25 hors d'oeuvres.